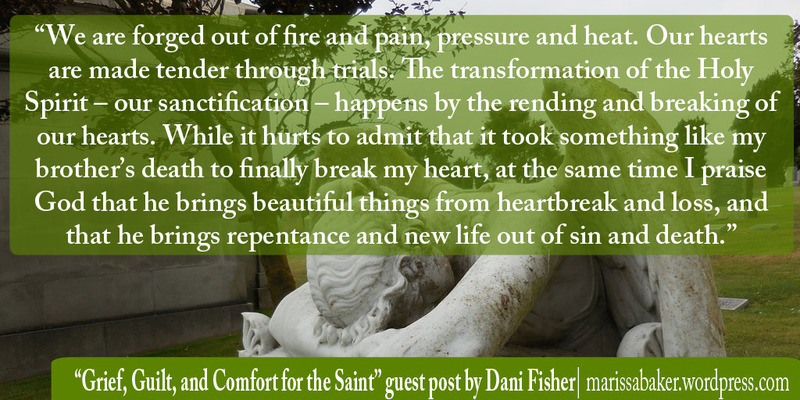 Today’s guest post is by Dani Fisher of A Vapor In The Wind. We met when she contacted me in response to my project about Christianity and MBTI types and I’m thrilled to have her sharing on this blog today. There are five stages of grief—denial, bargaining, anger, depression, and acceptance. Maybe you are familiar with these stages. If you have suffered any sort of traumatic life event or loss, you know these stages do not necessarily appear in this order. I would add one more stage to this whole process of grief—guilt. While in every big or small scenario of grief, guilt is not necessarily present, I would argue that when it comes to the loss of a loved one, there is always some manifestation of guilt. There is always something you regret, no matter how wonderful your relationship with your loved one might have been. This was my experience and for a long time I was unsure of what to do with my regret, how to respond to it and how to carry it. When my brother died, one of the first things my father said was, “We have no regrets.” He was right. By all objective standards, my family had no regrets in the life and death of my younger brother. My brother was an exceptional seventeen-year-old. He had a good relationship with his parents and siblings. I would contend that “good” does not do justice to the friendship my brother and father shared. The name Benjamin means “son of my right hand” and Ben fulfilled his name in every respect – he was my father’s right hand man. My brother was full of joy and ambition. He possessed one of the greatest servant-hearted spirits and work-ethics of anyone I have ever known. He was the person you could count on in a crisis. If you needed his help, he would show up and follow through and I know so many of his friends and family can testify to the number of times he dropped everything to help someone in need. More importantly, my brother loved Jesus and he loved the church. We had the privilege and joy of hearing his personal profession of faith and witnessing the evidence of his faith and the fruit of the Spirit in his character and his works. I still envy the grace and lightheartedness with which my brother moved through life. It’s something I continually aspire to. Ultimately, we had no regrets. My brother’s life was secured in Christ and because of that there was only glory in the blink of an eye for him the night he died. Certainly we had nothing to regret. Nevertheless, regret is an inevitable symptom of loss in a fallen, sinful world. For me it was a multitude of little things that, when accumulated, resulted in a great weight of guilt. There were the angry, hurtful words I wish I had never said – the encouraging, supportive words I should have said more – the affection and love I wish I had demonstrated more openly, thoughtfully, and generously. There were all the things we said we would together do but never did – all the little ways I should have been a better sister and friend to him. My family is a close-knit family. We love each other well. We always have been close – it’s a natural symptom of being raised together in a homeschooled family – but something changed when my brother died. It is difficult to articulate what exactly changed, but these days when we gather around the fireplace on chilly nights, sharing food and stories, laughing and praying together, giving each other hugs, serving one another, and joyfully upholding one another as we move on to our various vocations and callings, I cannot help but realize that things might not have been this way if my brother had not died. We are forged out of fire and pain, pressure and heat. Our hearts are made tender through trials. The transformation of the Holy Spirit – our sanctification – happens by the rending and breaking of our hearts. While it hurts to admit that it took something like my brother’s death to finally break my heart, at the same time I praise God that he brings beautiful things from heartbreak and loss, and that he brings repentance and new life out of sin and death. The circumstances of my brother’s death were so sudden and unexpected. One moment he was there and in the next he was gone. There was no opportunity to ask his forgiveness, to make anything right, to suddenly change my ways and become a better person. There was no opportunity for me to superficially absolve myself of my guilt. There was a temptation to stay in my miserable state of guilt, to live there and grow comfortable in it, and to believe that inflicting myself with regret and guilt would somehow right the past. I was struck with the harsh reality of sin – that no matter what we do, no matter how much we might think we can make things right, we can never undo the damage we leave behind in our wake. It is not in our power to fix it. We need Jesus Christ. We need his perfect life and sacrifice on our behalf. This is the purpose of regret, to be an instrument to drive us to the merciful knees of our Savior and to fashion us more and more into his likeness. But if we stay there – if we continue in our guilt and misery, we deceive ourselves. There is no condemnation for those in Jesus Christ. In him we are more than conquerors – dead to sin and alive to Jesus Christ! 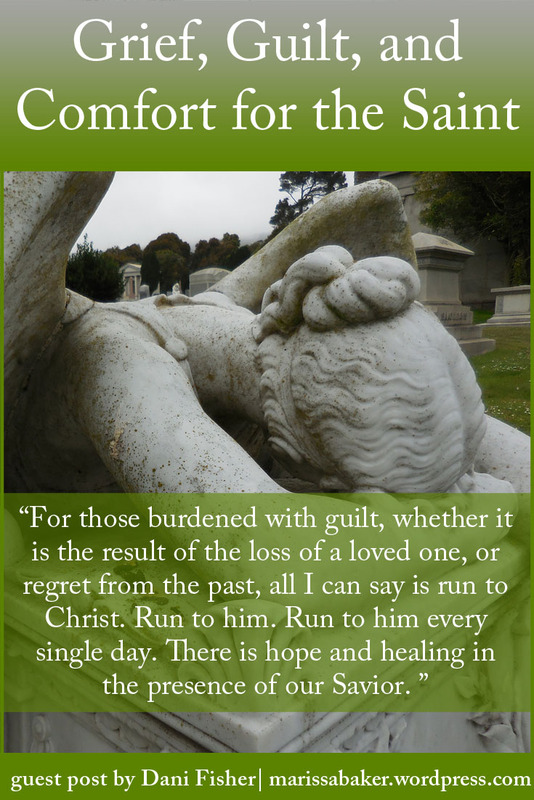 For those burdened with guilt, whether it is the result of the loss of a loved one, or regret from the past, all I can say is run to Christ. Run to him. Run to him every single day. There is hope and healing in the presence of our Savior. It is not a transformation that happens overnight. It took years for me to see the fruit of the seeds that were planted in the midst of our loss, grief, and guilt. It took years before the sorrow gradually dissipated, before the future looked anything but bleak, but I promise that hope placed in Jesus Christ is never, ever misplaced or misguided. Wait expectantly on him. Wait on him as you run to him. Author Bio: Danielle Fisher is twenty-two years old and works as an administrative assistant while studying to complete her undergraduate degree in Communications. In her spare time she enjoys spending time with family and friends, drinking copious amounts of tea, playing her piano accordion, and writing on her personal blog A Vapor in the Wind.